100% Made in Germany! 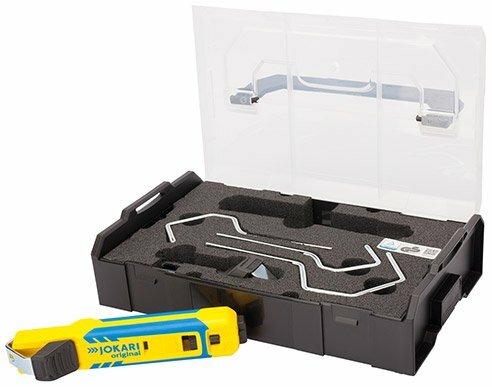 The JOKARI-Krampe GmbH company is a leading producer of cable stripping and de-insulating technology. The JOKARI System 4-70 cable knife is the newest version of our specialized cable knife which we have been producing for over 50 years. The new design is the tool of choice for stripping all standard round cables. The Cable Knife System 4-70 offers several benefits such as quick change hooks, for stripping many different gauges of wire, a safety lock security hook blade that can cut through jackets, and automatically lock back into it's "safe" position and a redesigned larger dual compound handle for easy gripping. This set includes all 5 different size hooks and comes in a handy carrying case. If you have any questions about this product by Jokari, contact us by completing and submitting the form below. If you are looking for a specif part number, please include it with your message.